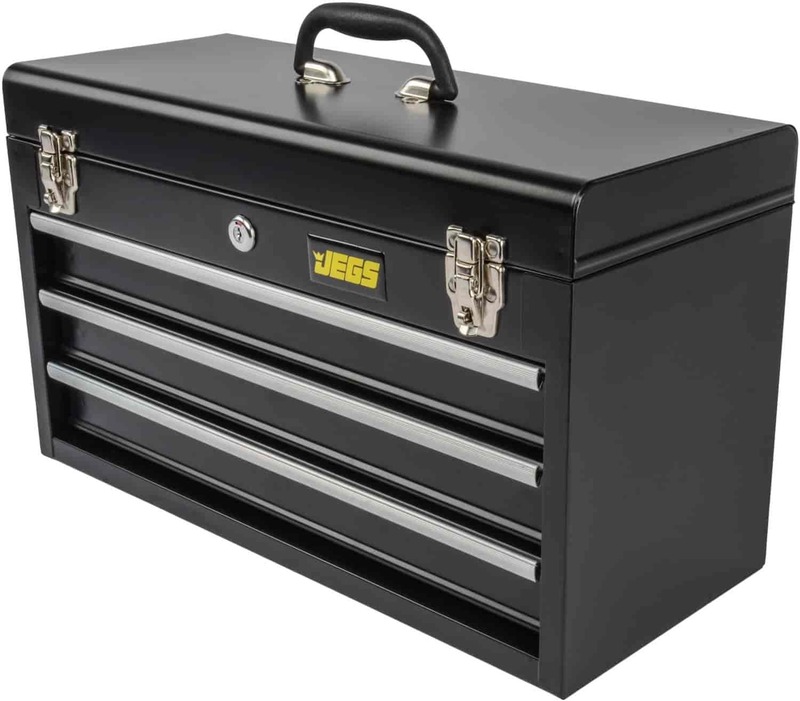 20.5" x 9" x 12"
Whether you are working at the track or in your own garage, you can keep your tools handy with JEGS Tool Boxes. Great for keeping you and your tools organized, these solid tool boxes are equipped with strength and durability; ready to work as hard as you do, no matter if you're a pro or hobbyist. Portable tool boxes & tool box carts are available. 81400 is rated 4.4 out of 5 by 17. Rated 5 out of 5 by Linda 19 from He likes it I bought this and really like it. Very functional and well built. My grandson came to visit NOW he likes it too. He likes it so much that I gave it to him. Rated 5 out of 5 by Captain Krazy from Grandsons first toolbox Bought for Christmas, Grandson and I were very pleased. Rated 5 out of 5 by Happy with the item from Has all the features I need Just what I needed at a good price, good price and quick delivery. Rated 5 out of 5 by Nick36 from Good quality Bought this for my wife to make up in.gets real dirty I take it outside and pressure wash the heck out of it and still no rust.very good product for the price. Rated 5 out of 5 by DanielJ from Tool Box Great product. Received this as a Christmas gift. Everything I expected. Rated 5 out of 5 by GarageGuy from Great Value! I bought this a few weeks ago, and am totally satisfied with it...just the right size to stack on top of my other boxes and the handle makes it easy to tote to small jobs around my garage. I'm also impressed that the drawers and top are ''double'' locking...keeps prying eyes and sticky fingers away from my tools and expensive test equipment. Might just buy another to top another stack of toolboxes. What are the internal dimensions of each drawer and the top compartment? 81400 tool box 3 drawer what is the weight limit. Does key lock drawers too or only top box ?? The drawers are 3&quot; deep. What is the total weight carrying capacity? Lucas Oil 10392 - Tool Box Buddy Aerosol 11 oz. Lucas Oil 10070 - Tool Box Buddy Lubricant 2 oz.